This crunchy, sweet granola makes a great topping for yogurt. Add dried blueberries to boost color and antioxidants. 2. 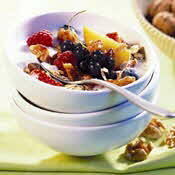 In a large bowl, stir together rolled oats, bran and walnuts. 3. In a small microwaveable bowl, combine honey and vanilla; microwave on high for about 20 seconds or more until runny. Stir to mix; pour over dry ingredients and toss to coat well. 4. Spread granola evenly in a large shallow baking pan. Bake in 300°F oven for about 30 minutes, or until golden, stirring two or three times. 5. Cool completely; granola will crisp as it cools. 6. Stir in raisins or other dried fruit; store in airtight container.